One of the keys to a wardrobe that lasts, is filling it with high quality clothing in cuts and colors that suit your personal style and lifestyle. So, as we continue our slow fashion mini series, I want to share some of things I look for to ensure I'm getting the best quality possible. As we delve into these tips, remember that cost is not always an indicator of quality and I hope these tips will help you spot the highest quality garment - regardless of the price. HIGH QUALITY, METAL ZIPPERS| First up, I like to take a look at the zipper on a garment and only select things with secure, metal zippers. Specifically, YKK zippers which are regarded as the best in the business. Also, unless an exposed zipper is key to the design of a piece, I like my zippers to be neatly concealed with no fabric overlap for snags. LINING | Next up, I like to look for lining - especially in more structured pieces like coats, blazers, skirts and pants. I love this feature because it usually means the piece was constructed with more care since it's an added step that takes time. Also, the lining helps stretch the life of a piece because it creates a barrier between your skin and the fabric. Last but not least, I love when the lining is a natural fiber like silk. EXTRA BUTTONS & THREADS | Another thing I look for (especially when buying something new) is extra buttons and threads either sewn into the care tag or placed in a small bag in one of the pockets. These additions are usually an indicator that the garment has been built to last and was designed to be around long enough to need repairs. Plus, these small touches make repairs a lot easier when you don't need to track down the exact thread or buttons used. NATURAL FIBERS | In my last video, I shared a few of my favorite natural fibers, why I love them for a lasting wardrobe and how I spot the highest quality of each. These fibers are also one of the top things I look for in high quality clothing. While this certainly isn't the only factor when it comes to longevity, it certainly helps and I've great luck with these especially when shopping second hand or vintage. STRONG, NEAT SEAMS & THREADS | Strong, neat, even stitches and seams done with strong thread are an absolute must for quality clothing. Before making a purchase, I always take a look at the stitching for any snags, obvious fraying or loose threads because these signs are an indication that the piece was assembled quickly and sloppily and they will only get worse with time. Next, I like to tug gently on the seams and make sure they don't fall apart of course and that they also have a good about of give without losing their shape. After all, our bodies aren't stationary and our clothing should move freely with us. Another thing I like to do is hold the stitching up to the light. If a ton of light comes through or I can clearly see to the other side, I'll pass on the piece. FINISHED SEAMS & HEMS | Much like the point above, finished seams are a strong indicator of quality. All of the seams on a piece should lay flat and have no puckering or other irregularities. If the piece passes that initial test, I like to flip it inside out and take a peak at how the seams and edges have been finished. Unfinished edges are a sign of very poor quality. 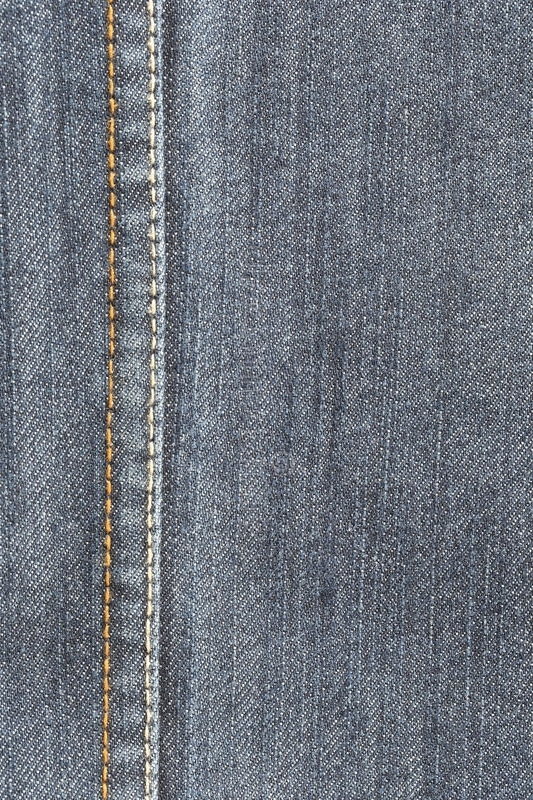 Serged edges (the common loopy egde that you see on most clothing) are better than unfinished edges, and they can last a long time but they aren't the best. These edges are pretty simple to do with a serging machine that does everything for you - sew the seam, finish the edges and cut off the excess fabric. French seams on the other hand, are the best of the best. These are much more complicated to do and are usually a true indicator of quality. EVEN PATTERNS | When shopping for patterned clothing like stripes, florals and plaids, I like to make sure that everything lines up properly. This is a great way to spot how much care and time was taken in the construction and how expensive the fabric may have been for each piece because you can't just use any piece of the fabric to make the garment. SECURE, STRAIGHT BUTTONS | You know how much I love great buttons and swapping cheap buttons for higher end buttons can elevate an entire piece. When it comes to quality though, I like to look a little deeper and make sure that the buttons are all perfectly in line and firmly secured. I make sure there aren't any loose threads, sloppy stitching, or other defects. Then, I like to pull the buttons slightly and make sure they don't unravel and I check if they've been reinforced by a smaller button on the back. This last touch is one that you'll usually only find in very well made pieces. That last thing I check on the buttons is that the buttonholes all line up with the buttons, are sewn well, and that they aren't too small to accommodate the buttons. EVEN, RICH DIE | Like I mentioned in my last video, some fabrics dye easier than others but I still like my pieces to have a rich, even dye throughout and I won't buy something that's faded or blotchy. If I'm shopping second hand though, I'm a little more forgiving in this department because you can have some pieces re-dyed. WELL-CUT | Last but not least, I like things to be well-cut and offer a tailored fit even without tailoring. When creating clothing, the more tailored the piece, the longer it takes to sew. Something that already looks good off the rack was likely constructed with more care and time than something that has a one size fits all feel. This is especially true of my blazers and coats and I won't buy either unless they have a structured defined shoulder and the sleeves are the same length.